Imagine being able to see the skyline of Singapore stretch out before you at sunset. Now imagine being able to enjoy the coolness of a pool in the heat of the Malaysian evening with a cocktail in hand with this view. Sounds nice, right? Now imagine that you’re on the 57th floor of a building while doing this and the pool looks like it just ends where the city begins. 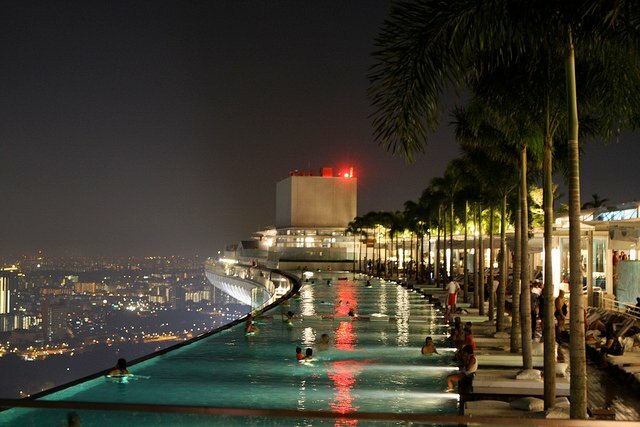 That’s the experience of the Infinity Pool of Singapore. You’ll find the Infinity Pool at the Marina Bay Sands, a hotel that has over 2,500 rooms, a casino, a museum, and a full shopping mall. It’s the world’s highest infinity pool and the best part is that you can swim right up to the edge and see the city stretch out before you! The pool itself is a pretty good size, nearly 500 feet long, so there’s plenty of room to cool off. If you’d rather just lounge on the deck and see the lights of the city turn on underneath a palm tree, you can do that too. In order to access the pool, you’ll need to be a guest of the hotel. Room specials begin at $339 per night, or about $270 in American money for the conversion rate at the time of this writing. You’ll access the infinity pool from the SkyPark, which sits on top of the hotels three individual towers and looks like a giant spaceship that sitting on top of the sky. If you really want to feel brave, the edge of the pool comes up to a walkway that has a waist-high rail protecting you from a tumble over the edge! The vibe of the pool is calm and there’s a segregated section for families so there’s some quiet adult space that can be obtained as well. Lifeguards are on duty while the pool is open and for an added taste of luxury, you can have a lounge in the pool that sits underneath a gentle waterfall. 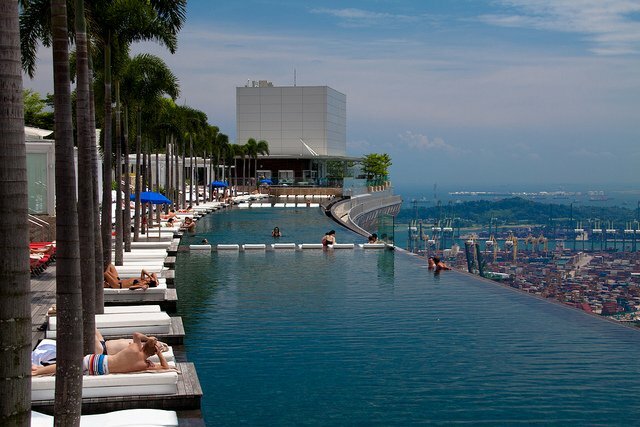 If your plans take you to Singapore, invest in yourself and spend a night or two at the Marina Bay Sands. You’ll definitely have a room… and a pool with a view! Oh my gosh, those pictures are incredible! Unfortunately when I went to Singapore for work, my company did NOT splurge for that hotel = I always wondered if it’s really worth it to stay there, (normally high-end hotels don’t entice me at all), and it looks like it is worth it – the pictures from the pool are breathtaking!